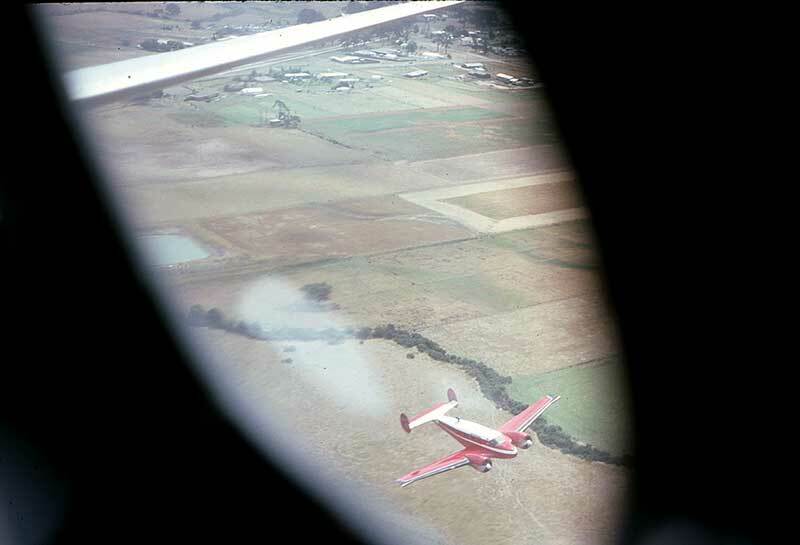 Joe Drage's farm airstrip from VH-ABH in the late afternoon, as John Love departs for home at Albury NSW. 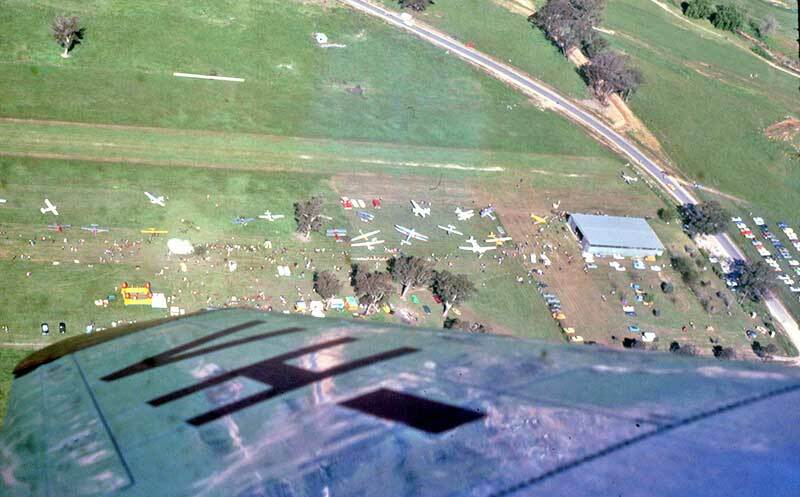 Drage Air World facility at Wangaratta Airport. 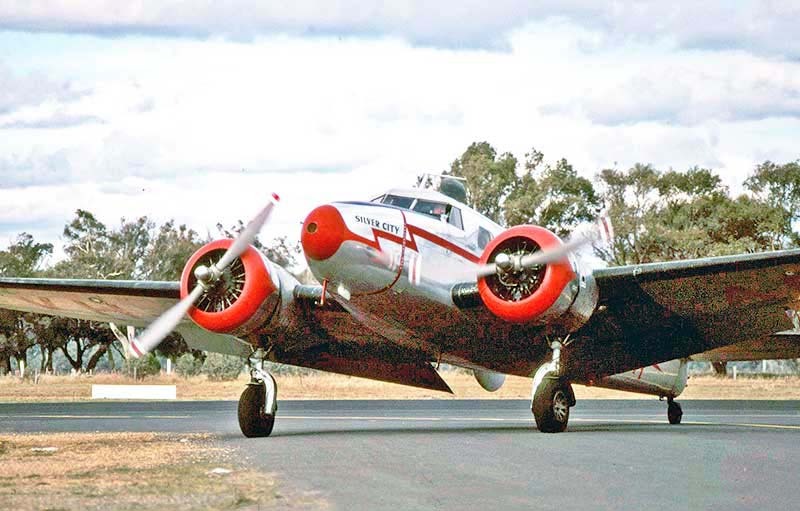 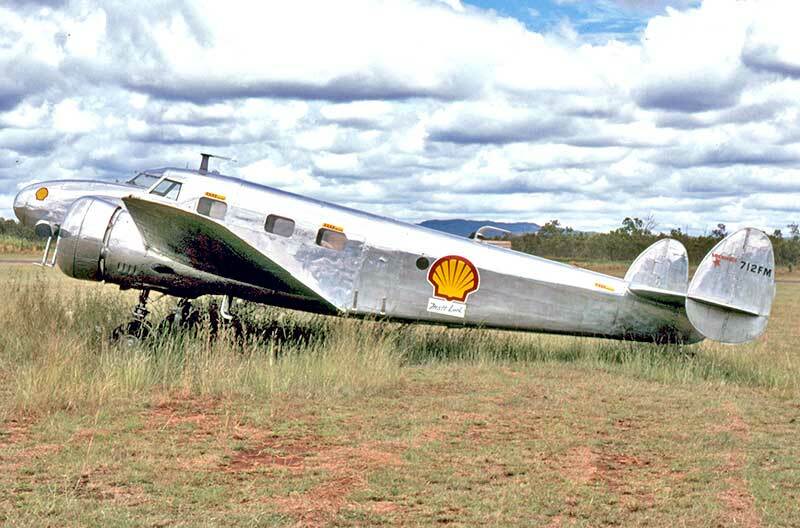 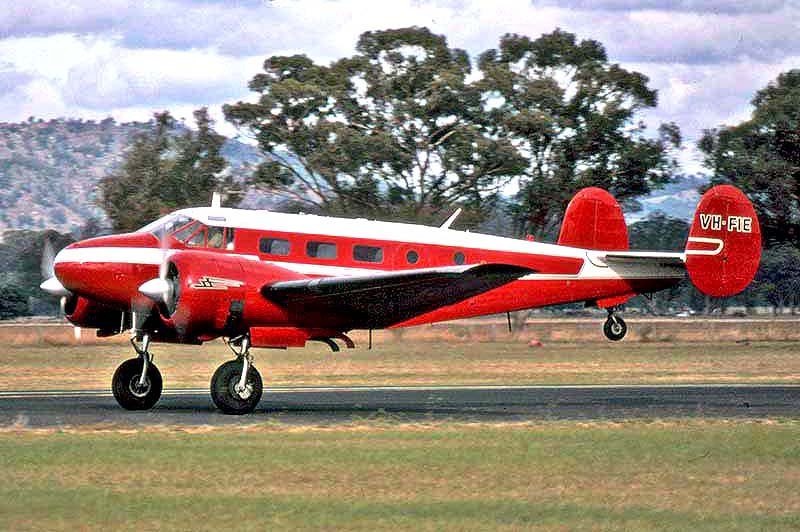 This magnificent Lockheed is still flying today with a Queensland owner. 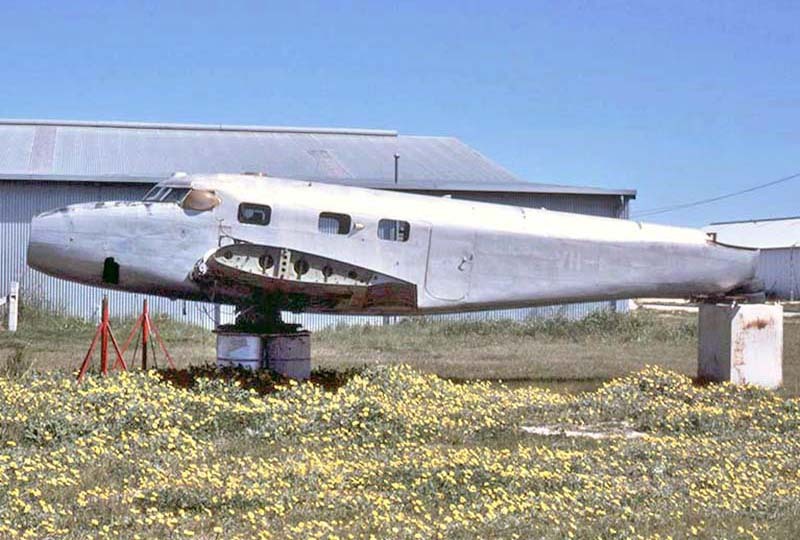 VH-ABH and had been moved around by successive owners ever since an undercarriage collapse at Ceduna SA in 1960. 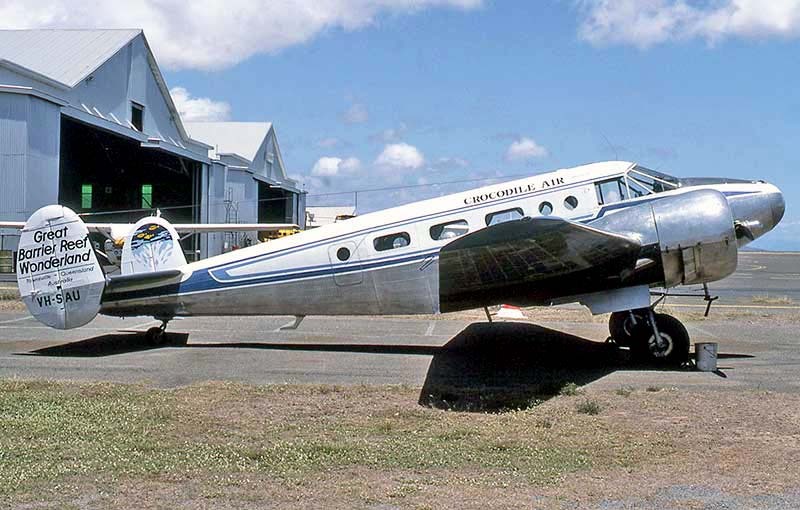 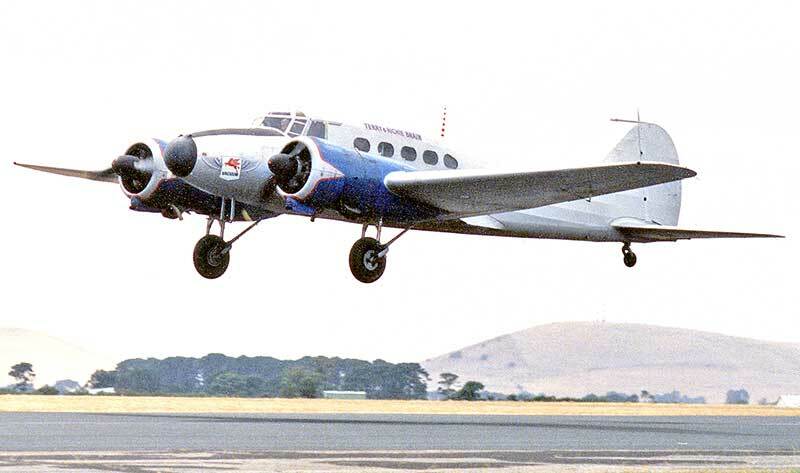 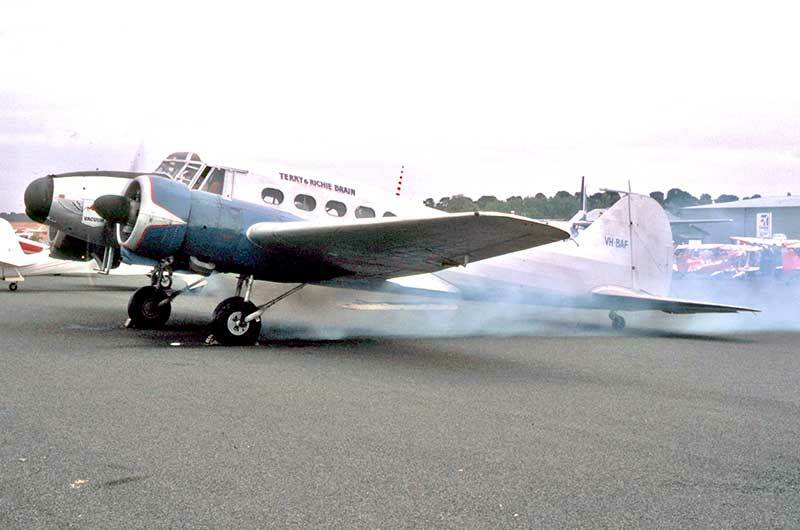 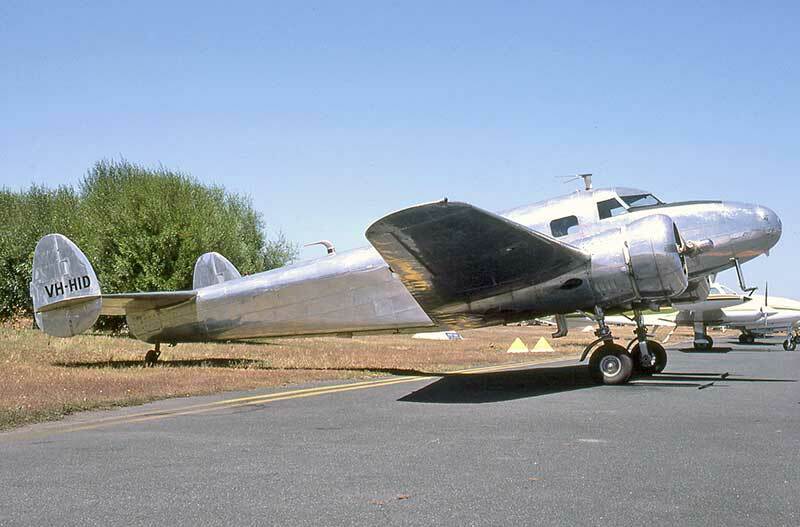 This Lockheed 12A N712FM was ferried from USA to Cairns in June 1982 for its Mareeba Qld purchaser. 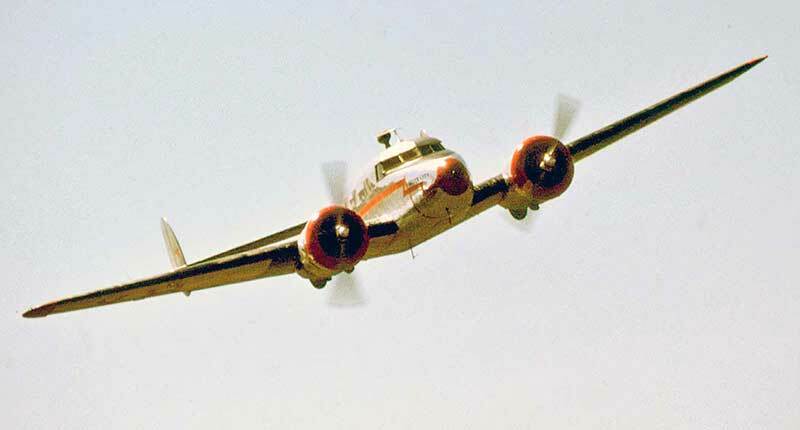 The Beech 18 series was manufactured by Beechcraft for over 30 years, following the prototype's first flight in January 1937. 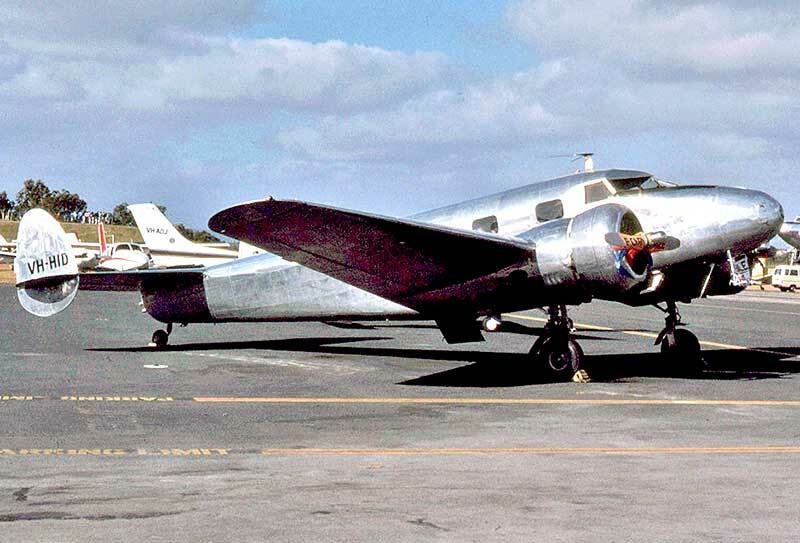 Although sharing the same twin radial, twin tail concept of the Lockheed 12, they were very different aircraft. 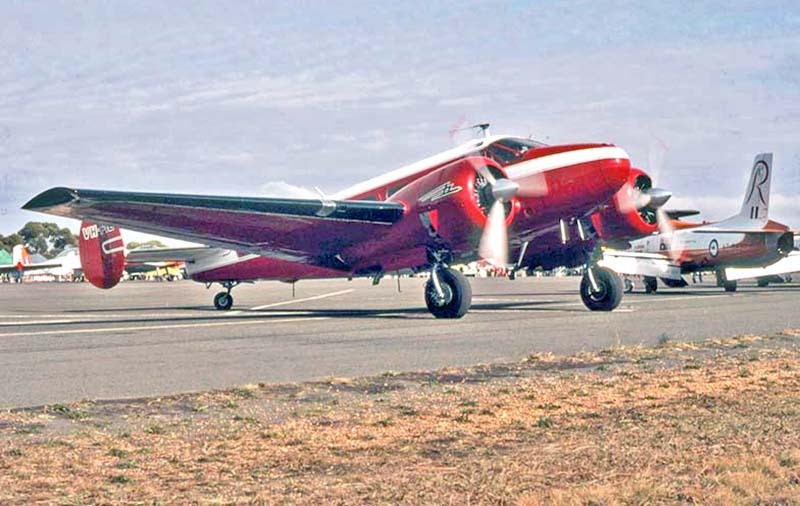 VH-FIE seen taking off at Mangalore Vic in April 1984 was a model D18S, built at Wichita Kansas in 1952. 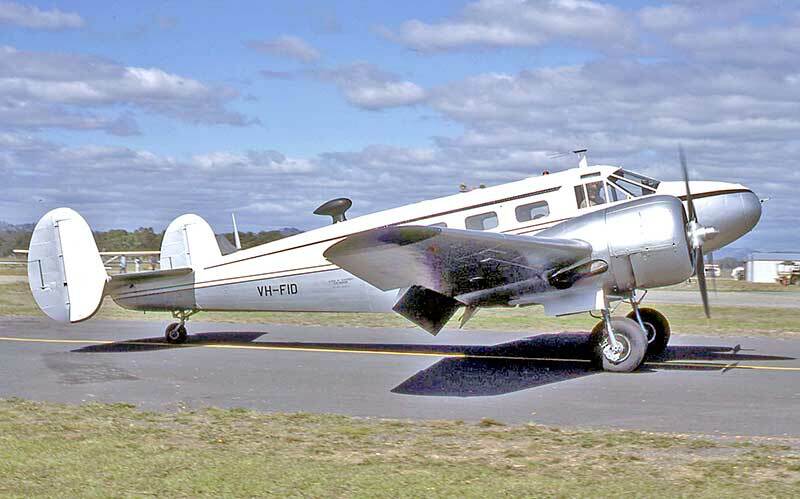 Savage Air Services Beech D18S VH-SAU flew small parcel freight work from Ballarat Vic, where it is seen in January 1984. 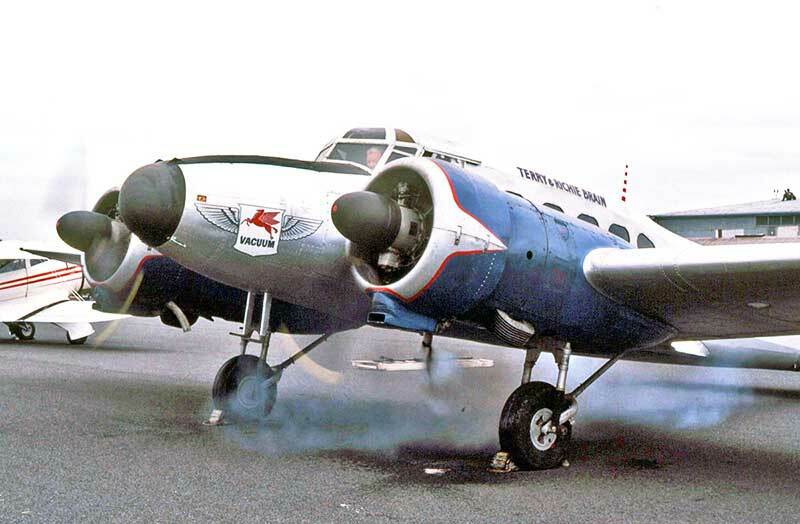 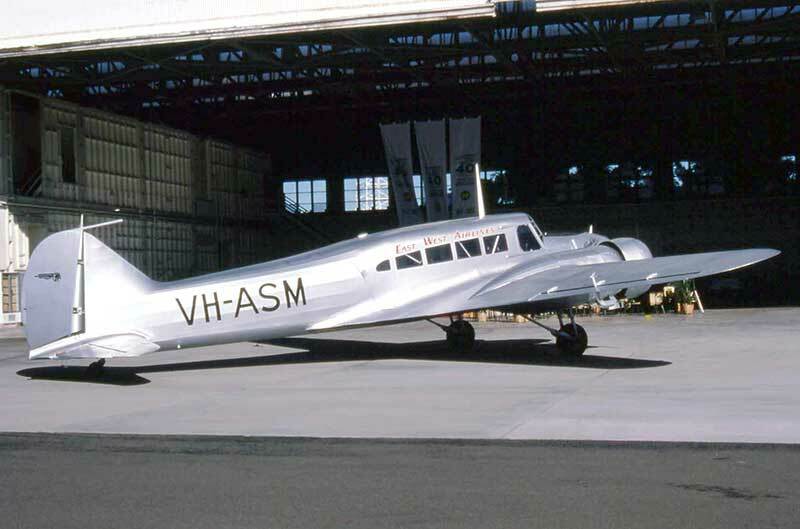 The first trigear Beech 18 imported to Australia was this 1964 model Super H18 VH-PDI, with the factory-fitted Volpar trigear option. 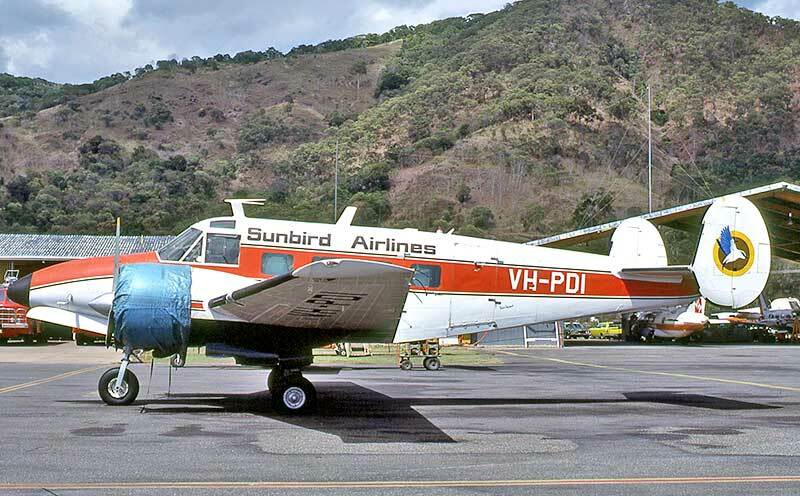 In 1975 it was ferried from USA by Helitrans Australia at Cairns to support their widespread chopper operations in New Guinea. 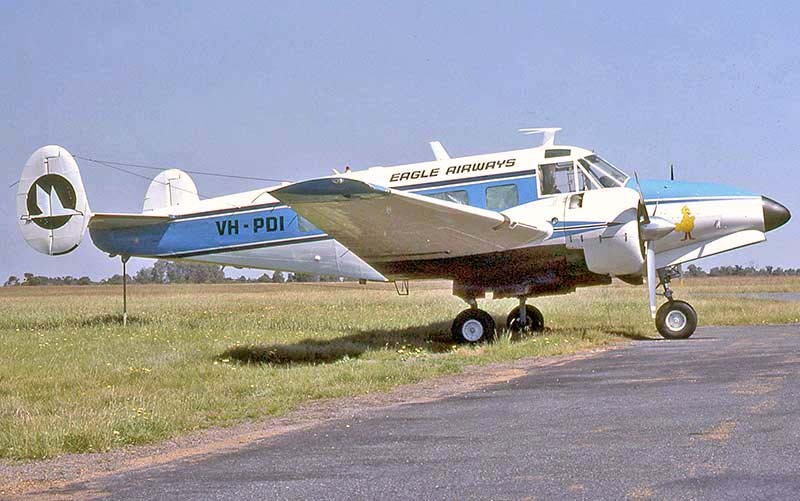 In 1980 VH-PDI went to Eagle Airways, Sydney for a contract delivering day-old chickens to poultry farms all over Australia. 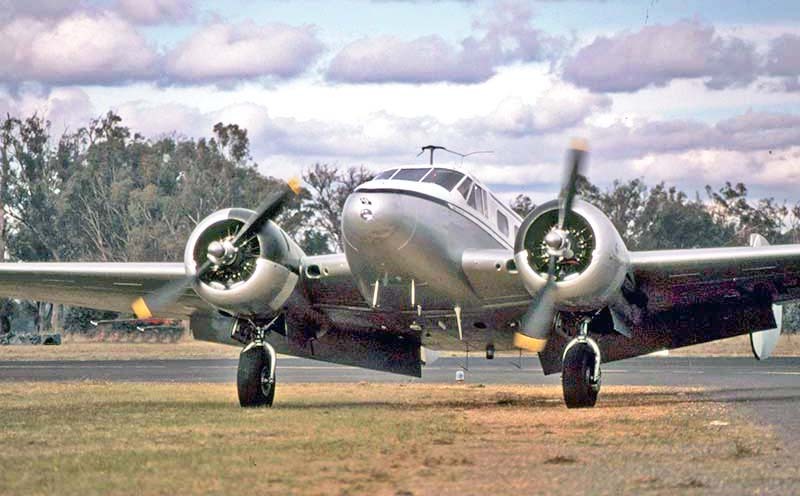 metal Avro 19 mainplane, more powerful Cheetah XV engines, hydraulic undercarriage retraction and many other mods. 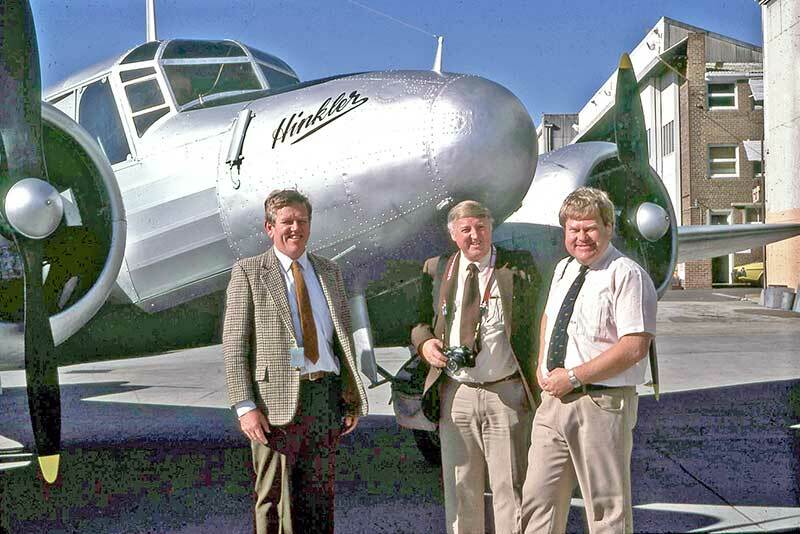 Ballarat February 1987, I was on board when Terry and Russ flew VH-BAF for another airshow display. 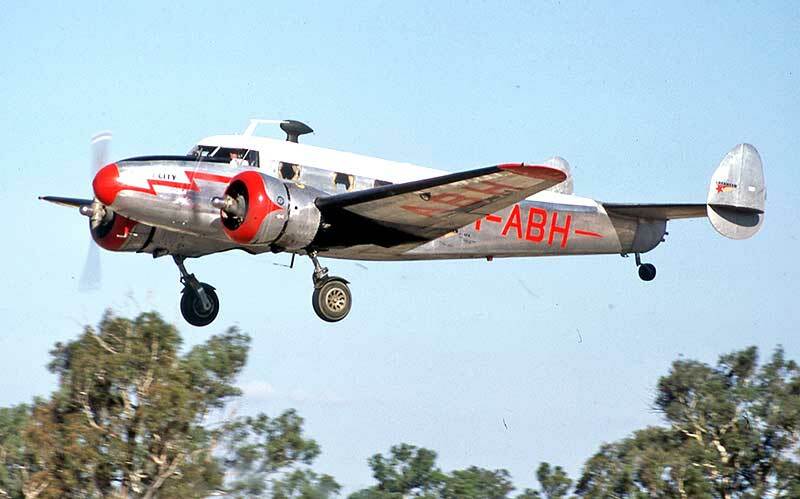 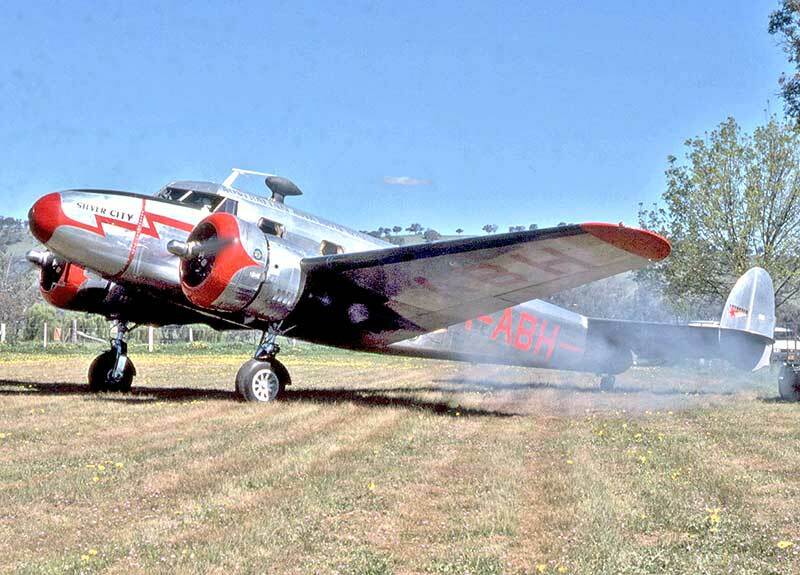 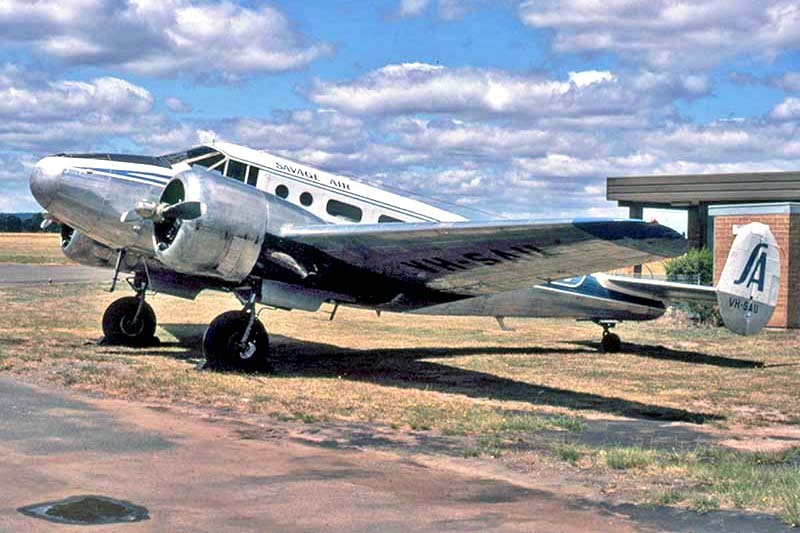 Another surviving wartime RAAF Anson was VH-ASM, which flew the first East West Airlines passenger service in June 1947. 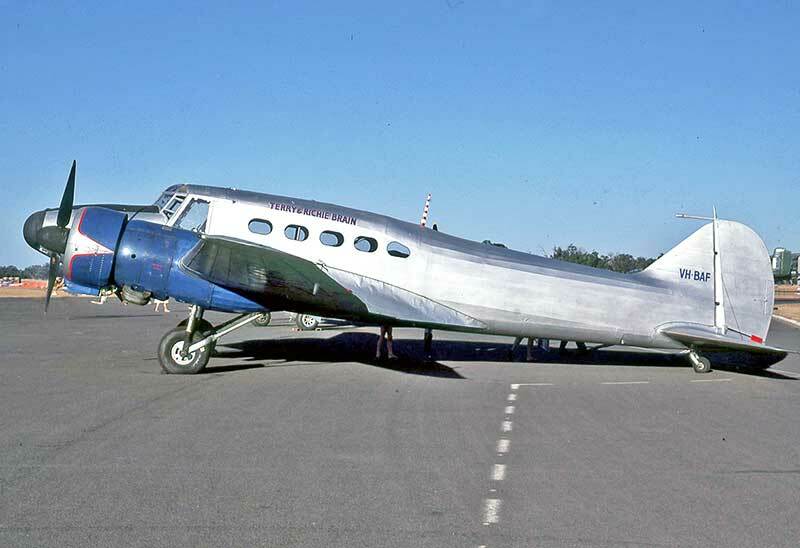 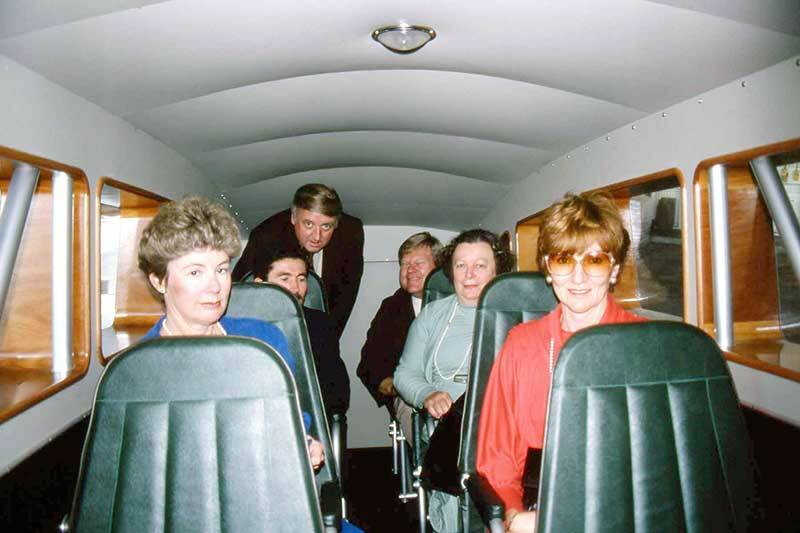 John Gallagher and his wife Chris completed the remarkable feat of rebuilding the Anson from a collection of derelict parts. 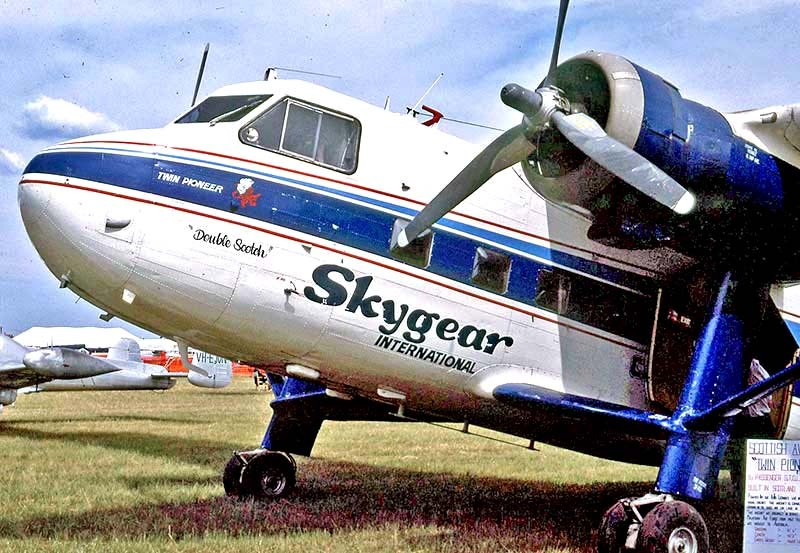 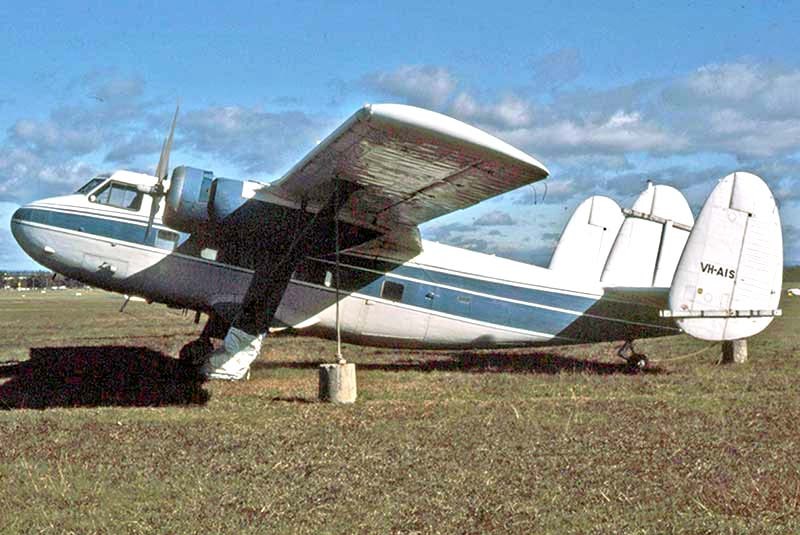 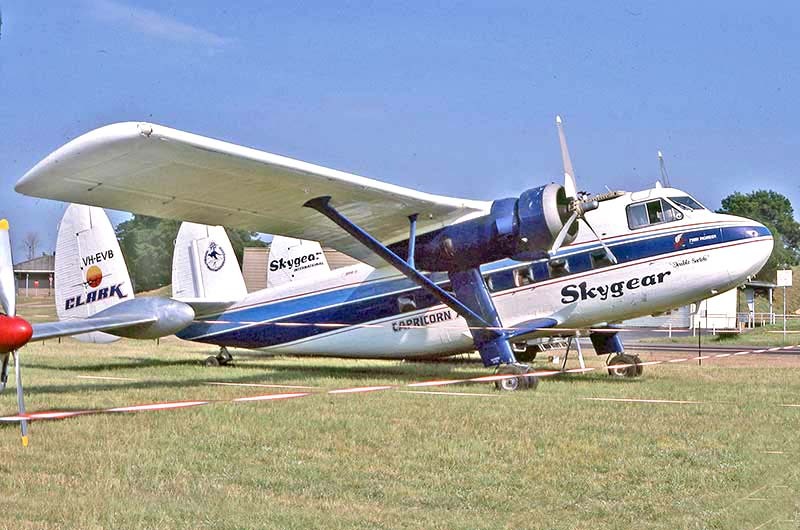 Scottish Aviation Twin Pioneer VH-AIS at Bankstown in July 1983, used by Aerial Agriculture Pty Ltd for mineral survey. 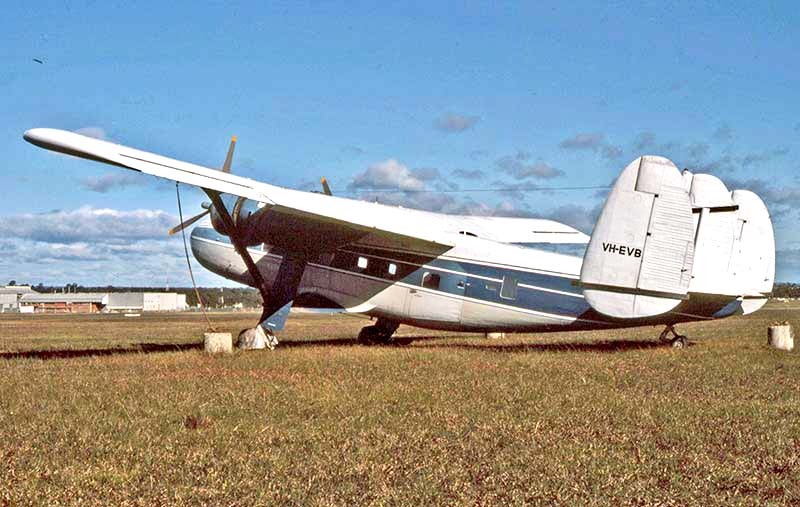 VH-EVB was one four retired Malaysian Air Force Twin Pioneers purchased by Aerial Agriculture in 1972. 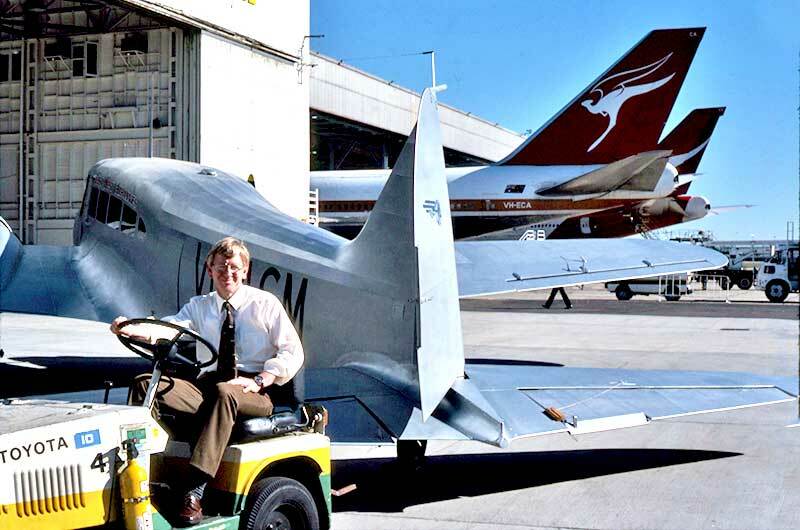 VH-EVB looking a lot happier in October 1988, with an enthusiastic new owner Capricorn Air at Coolangatta Qld.